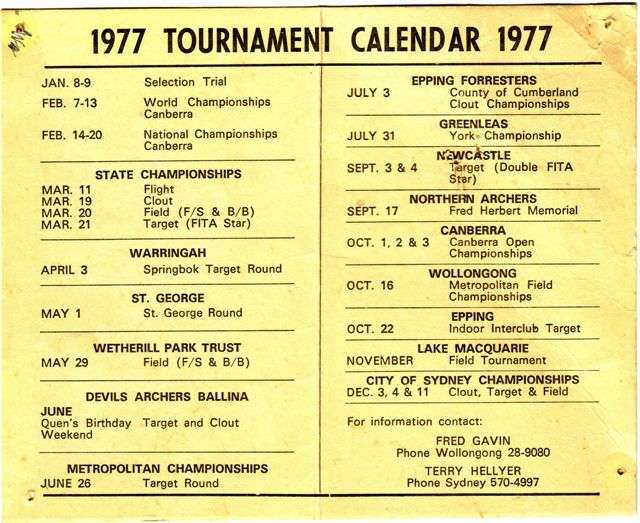 In 1974 David Onslow was a member of Northern Archers and a work colleague Danny Stasenka let him know that they were trying to start an archery club on the Northern Beaches and would he be interested. The club consisted of 5 members, and was set up in North Manly, by the river on the other side of the golf links, mainly a shed which kept getting flooded (and we all know what that does to stramits), and shooting became a little hazardous at times as members of the public still wanted to walk within this public access area. Then by a stroke of luck they heard that Warringah Shire Council was going to start allocating school grounds for sport, so Barbara Stasenka and David Onslow attending the meeting where the oval of Cromer High School was allocated to Warringah Woodsmen Archery Club in 1976.